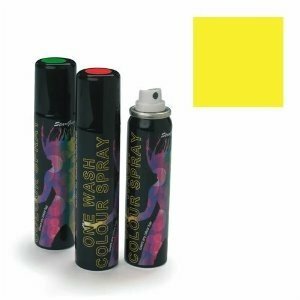 Stargazer's Yellow Colour Hairspray gives a temporary hair colour, which can be applied with ease and washed out in one shampoo. All colours can be applied to any type of hair, giving a thick cover of colour - ideal for the "one-shot" hair colour treatment. There are a number of 'neon' shades available which glow in UV light, perfect for clubs, raves & festivals. Gold & silver are also available to create a more metallic effect.